Been looking of one of these for a while and the price has dropped on Black Friday from a number of stores including the linked CR one, but also including Wiggle, Evans and Wahoo themselves. I got it from CR as you also get the 10% off with British Cycling membership. So £170.99 with that extra off and also potentially cashback from the likes of Quidco (may not go through with this BC discount). Wahoo is breaking the GPS bike computer stereotype! Equipped with Bluetooth 4.0 and ANT+ dual-band technology, ELEMNT pairs seamlessly with all of your cycling sensors. No more confusing menus! ELEMNT comes with a free companion app that allows you to set up your data fields, customise profiles, track performance, and share ride data effortlessly. Plus, programmable LED QuickLook Indicators provide a quick way to see if you're on pace with important performance metrics like speed, cadence and power. Simple to set up, simple to experience, simple to stay connected, simple to navigate, and simple to suffer - the ELEMNT GPS Bike Computer gives you the POWER you demand with the simplicity you expect! Use Wahoo's Planned Workouts feature to stick to a training plan and get the most out of your time on the bike. Brilliant bits of kit! So far waaaay more reliable than my clunky Garmin 810. A lot more basic unit mate. This is different league. However, each to their own. Ah, yes, I forgot about the "My bike/moped/car/whatever is cheaper than this" fanboys. Added regular price to title. These Wahoo units don't generally get the same discount as other brands I've noticed. So thought this might be relevant. 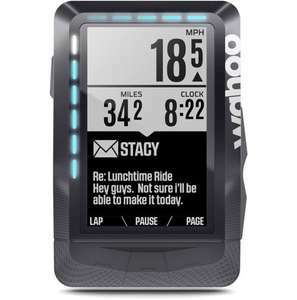 Just to add the Wahoo ELEMNT GPS Cycle Computer Bundle is also available for £249.99 with speed and cadence sensors + HRM belt. Also a good deal if you need the extra stuff. Amazon just reduced the price to £177.00!! Cheaper in CR @£170.99 with CAR discount. Nevertheless a great price if not a CR member. A lot more basic unit mate. This is different league.However, each to …A lot more basic unit mate. This is different league.However, each to their own. How though.. basic in what way? 530 does all this an includes cadence and heart rate at this price.. It's down to personal choice, gave this a blast but went back to the Garmin 520 quick smart. It's down to personal choice, gave this a blast but went back to the …It's down to personal choice, gave this a blast but went back to the Garmin 520 quick smart. Clearly you don't value the turn by turn navigation, superior usability and miles better reliability this offers over your 520. So I am getting this with the British Cycling 10% discount for the grand sum of £165.42. I have one, It's way better than my old Garmin. Don't be put off by the monochrome screen. Colour screens look good in the shop but when you are out in brilliant sunlight and wearing polarised sunglasses colour screens can be a nightmare. It can be very hard to distinguish the difference between your route and track and an A road or motorway. Whereas on the Wahoo your route, track and roads remain totally clear no matter how bright the sunlight is. How though.. basic in what way? 530 does all this an includes cadence and …How though.. basic in what way? 530 does all this an includes cadence and heart rate at this price.. The mapping limitations are big issue for me. In the end (with quidco cashback) I paid about 20 quid more than the 530 for I believe a much more performant solution. Don't get me wrong, the 530 seems a good unit for the cash, but I think these units Element (and Bolt) units are much better value - when at these sale prices of course.